Megan Devine Moves Forward in New Santa Anita Role by Reinier Macatangay: A quick glance through Megan Devine’s own website reveals a lot. Originally from Long Island, she traveled to Kentucky in order to attend the University of Louisville. At UofL, Megan became highly active in sorority groups, rode horses competitively (almost making the U.S. Equestrian Team), worked as a Cardinal Ambassador and even won the 2014 Miss University of Louisville title. She graduated from the school’s Equine Industry Program. Santa Anita Park has announced that Angela Hermann and Megan Devine will work as a broadcast team analyzing races and interviewing horsemen trackside and from the paddock throughout Santa Anita’s upcoming Autumn Meet which opens Friday, Sept. 30. 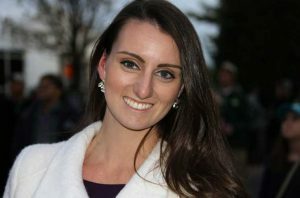 On a personal level, she has always been friendly since mutual friends introduced us last fall at Keeneland, so it made sense to feature her in a new article before she debuts as simulcast feed co-anchor at Santa Anita Park. Devine answered questions relating to settling in a different environment, handicapping, fashion and more. While she chose to leave behind the more quiet Kentucky for the greater Los Angeles area, the multi-talented personality loves her new workplace. The world of handicapping is a tough place, with a plethora of online analysts giving advice without any real ability to understand the nuances of why horses win and lose. Devine initially had help from a friend. Next, the question of “Who was your favorite person to interview?” came up. Her response may surprise people, as she chose a low-profile trainer (who will almost assuredly be a common name soon in racing). 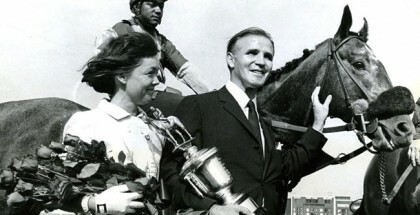 Of course, no horse-related interview is complete without asking about a person’s favorite racehorse. Some active and retired names were given, none of which seemed too surprising. Fans might not realize Megan Devine also contributes to Fashion at the Races, headed by our friend Bri Mott. The website promotes fashion at the racetrack as a way of creating a more enjoyable environment for everyone attending. 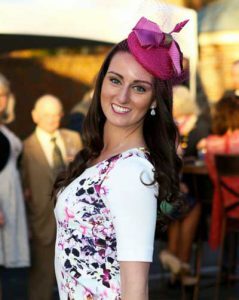 Fans might not realize Megan Devine also contributes to Fashion at the Races, headed by our friend Bri Mott. 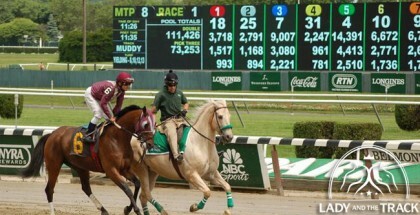 The website promotes fashion at the racetrack as a way of creating a more enjoyable environment for everyone attending. Santa Anita Breeders’ Cup attendees are already thinking about their outfits. Devine offered advice for women making the trip to Arcadia in the first weekend of November. No one will argue she is beautiful herself, and holds the knowledge and talent to move up in the industry. To see Megan in action, watch the Santa Anita simulcast now through early November, or visit the racetrack. She will gladly give advice to anyone about handicapping or just happily talk about horse racing in general.